The Law Offices of Rovner, Allen, Rovner, Zimmerman & Nash provide expert legal services and can provide clients from the Philadelphia, Bucks County and Montgomery County regions with a lawyer who is an expert in SEPTA bus accidents. A SEPTA bus crash can cause serious damage to pedestrians, passengers and drivers due to the vehicle’s size, lack of seatbelts and sudden stops. Such an accident can leave you with a number of problems such as injury, medical bills and repair costs. An attorney from our firm understands these issues and will go over all legal options with you. The aftermath of a crash can last for a while. Dealing with insurance companies and paperwork is exhausting. After getting into a bus crash, you will need an experienced lawyer, who can confidently walk you through each step. When employing the services of an attorney from our firm, you also get access to our investigators who can go to the scene of the crash and document conditions, photograph the scene and the vehicles involved, interview witnesses, and gather other evidence. 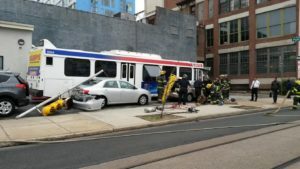 Our attorney will help determine if the SEPTA driver was at fault for the crash due to driving under the influence, negligence, poor judgment, violating the traffic laws, or falling asleep at the wheel. Your SEPTA accident lawyer will first meet with you for a free initial consultation to discuss your collision and develop a strategy for maximizing your compensation. Our attorney will help you if you are a driver, passenger or pedestrian. We have a number of experts and resources at our disposal. These accidents do not just happen in buses; they can also occur in a trolley, train, subway car, paratransit van or at any of the ancillary facilities where these vehicles operate. Whether you are in Philadelphia and need a taxi lawyer or are in Bucks County and need an Uber lawyer, we will provide you with the experienced lawyer and settlement you deserve. Residents of Philadelphia, Bucks County and Montgomery County who have dealt with the troubles of a bus accident are glad they turned to the Law Offices of Rovner, Allen, Rovner, Zimmerman & Nash.